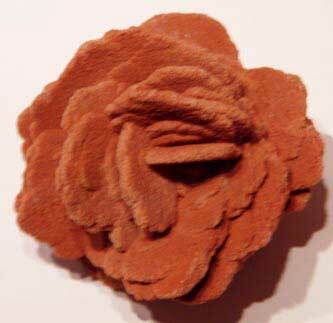 Single rose rock; photo © Timberlake Rose Rock Museum (all rights reserved; used by permission). 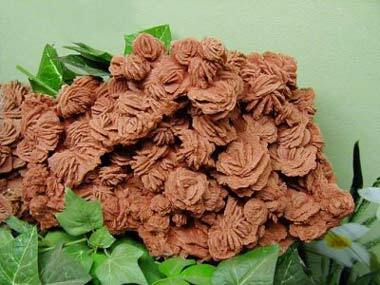 These rocks were formed by barite rock crystals during the Permian Age and resemble blooming roses. Barite rose rocks can be found in clusters with only two roses to as many as hundreds of roses (some clusters weigh hundreds of pounds). In Oklahoma, the distinctive red soil colors them in hues ranging from reddish brown to cinnamon - rose rocks are sought after and prized worldwide. An old Cherokee legend says the rocks represent the blood of the braves and the tears of the maidens who made the devastating "Trail of Tears" journey in the 1800's to Oklahoma. Rose rock cluster; photo © Timberlake Rose Rock Museum (all rights reserved; used by permission).